Like most mentalist tricks, the Half and Half trick gives the audience a false choice before revealing that the magician is a master of mind reading. The magician holds aloft a large sheet of cardboard. Along either side five cards are held in place with an elastic band, backs to the audience. At the top is a clip. The magician declares he will read the mind of a spectator and asks that one step forward. The magician takes a marker and writes on the side of the card board closest to him - “My prediction” he says. At this point he asks the spectator to point to one of the ten cards. The magician takes the card and places it under the clip on his side of the board and then turns it to show that the card chosen matches his prediction written large and bold before hand. The false choice created by making ten special cards in advance is the secret here. Ten special cards are made (instructions below) and either a large clipboard with a notepad or a sheet of cardboard and a clip. Elastic bands and a marker round out the materials. The magician creates the special Half and Half cards and then places them in the bands. The notepad should be attached to the clip and the marker placed nearby. This trick is more effective with a sheet of cardboard and a clip, but using a large clipboard with paper allows for reusing it for the next show. There are two parts to this trick - creating the cards and then performing Half and Half. 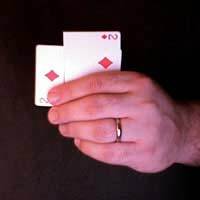 This trick requires ten identical cards and ten indifferent cards – the magician should make sure that one of the indifferent cards is not the same as the ten identical cards. Each of the indifferent cards should be cut across the width; about a third of the card is required. Each indifferent third is then glued atop one of the ten “force cards”, so called because the magician is forcing the spectator to chose this card unbeknownst to him. When done the card should be two thirds force card and one third indifferent card. The ten cards are placed under the elastic on the back of the cardboard sheet. From the magician’s point of view only the indifferent end should be visible. The magician chooses a spectator and then declares he will look into the future and make a predication about which of the ten cards the spectator will chose. The magician then writes the force card on the cardboard sheet, out of view of the spectator. The magician allows the spectator a free choice, but not to touch the cards. After the choice is made, the magician allows the spectator one chance to change his mind and make a new choice. Once the choice is made, the magician takes the card (back facing the spectator) and clips it under the clip at the top of the cardboard. The indifferent end is hidden under the clip, and only the force end is visible. The magician then turns the board around to show that his prediction did, indeed, come true. Do not make the clipping of the chosen card into a performance - the more natural and quickly you can do it, the more believable this trick is.